Sending a quicklink is the easiest way to share or distribute an asset with recipients. Using "Add to quicklink", assets will be loaded in the Share tab, where you can send multiple assets at once. You may also click the Quicklink M-box showing up at the bottom to open the Quicklink pop-up. 1. Select recipients - you can either select a predefined notification list, which will send a quicklink to all the users in the list, or manually enter email/phone number. Note! You can send a quicklink to any phone number in the world. Type the country code in front of your recipient's phone number, but don't type + or 00 in front of the country code. For instance, to send to a UK phone number, type "44" immediately followed by your recipient's number. 2. Enter a subject/comment - comments are required. Your recipient(s) will not see the subject. 3. 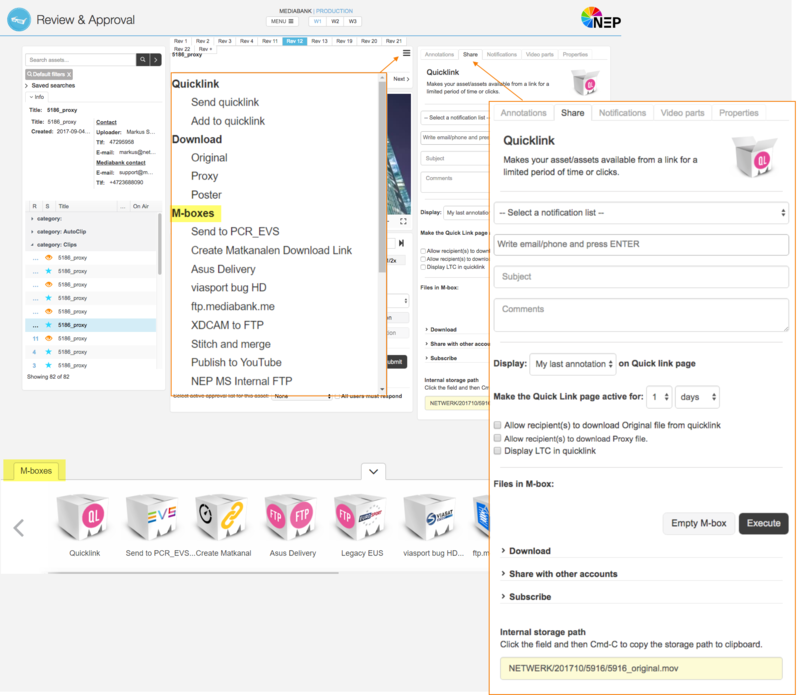 Display annotations - if you're sending a quicklink from Review & Approval or Compliance, you can choose to let the recipient see all, some, or none of your annotations. This option won't show up in Library. 5. Allow or don't allow downloads - should the recipient(s) be able to download the asset file? You can either let them download the original, or the proxy - the low-res version you see in the Mediabank player. 6. Execute - your quicklink is sent!